So, I landed in town with a skeptical mindset. I mean, everyone said Portland had the most AMAZING craft beer scene too before I moved there, and that wasn’t at all the case in PDX. However, what we found in Montana, and especially Missoula, far surpassed the quality of most breweries you’d find in Portland. I could not have been happier to spend four days in town exploring the best breweries in Missoula. The unique aspect about breweries in Missoula, MT is the fact that most of them don’t have liquor licenses. Liquor licenses cost a bundle (sometimes up to a million dollars), and they’re very limited in Montana because there is only a small number up for grabs in any given city. 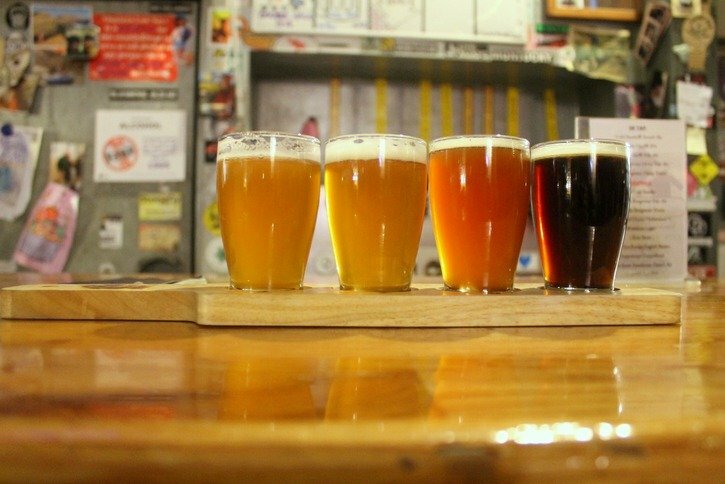 Instead of the Missoula breweries, it’s mainly just the local Missoula bars that have been there for ages that hold liquor licenses and the freedoms that come with them. 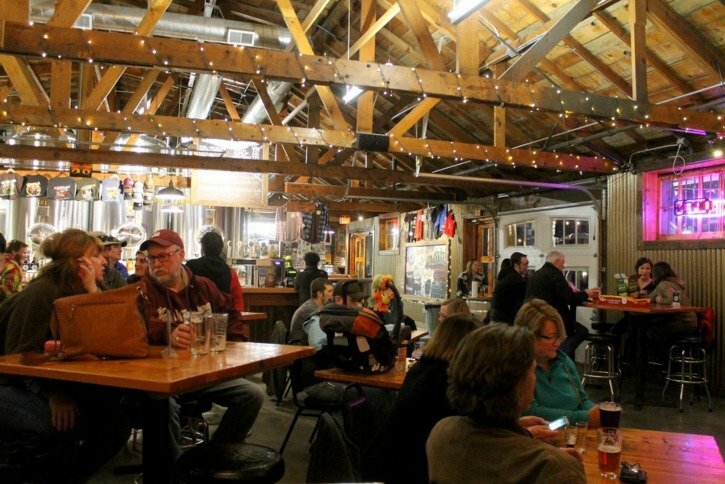 Drinking Missoula beer is one of the best ways to get to know the city and its locals. What this means for the majority of breweries in Missoula is limited hours and limited alcohol per customer. This was fine with me since we were only wanting to try a taste of each Missoula brewery, and as long as you’re not out to get messed up at one brewery in Missoula, you should be fine too. As a tasting room, these Missoula breweries can only serve 48 ounces – or about 3 pints – of beer to each customer per day. They keep track of this usually with a punch card that they mark each time the customer buys a new beer. These premises are also only allowed to sell alcohol from the limited hours of 10 am to 8 pm. Even with this said, the breweries in Missoula, Montana and all over the state are booming right now. KettleHouse was the first of the Missoula brew pubs we stepped into our first night in town. We walked down a snowy side street and actually walked right past it initially. Hidden away in a converted garage, we came across the southern and newest location of KettleHouse Brewing. When we walked inside we were taken aback by not only how friendly the bartender was but also how knowledgeable and helpful he was as well. He took the time to walk us through the beer and answer our random questions, like why so many of their beer names reference weed *cheeky grin*? We never made it to their other Missoula brewery, but we were impressed with what we found at their newer one. Their Cold Smoke Scotch Ale is the best of that style that I have tried in a very long time. I’m still dreaming about it. Practical info: Location: (1) 313 N 1st Street W, (2) 602 Myrtle Street; Hours: open seven days a week except for major holidays, 12pm-9pm. Tamarack Brewing was our second brewery experience in Missoula, and it was the complete opposite to KettleHouse. Although the staff was still friendly, the waiter was not quite as knowledgeable about the beer, and the whole place came off as much more commercial. That’s not to say it was a bad experience, not at all. It was just a very different one from the other breweries in Missoula, Montana. 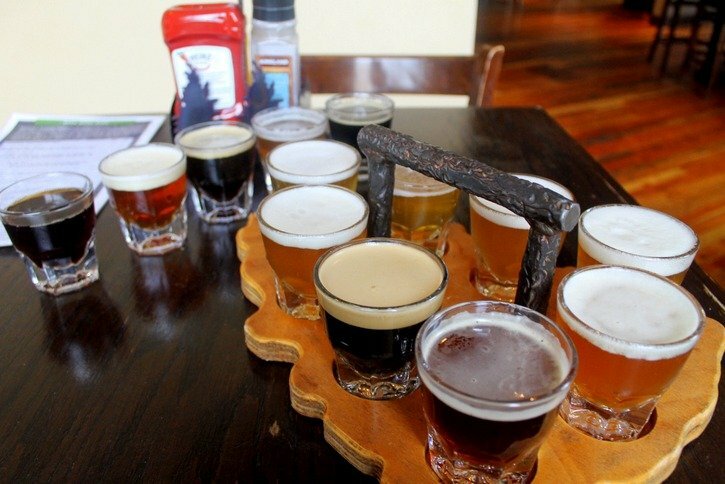 Think of a semi-large and open sports pub with good beer and you’ll have Tamarack. My personal favorite of their beers? Hands down, Sip And Go Naked Apricot Ale – okay, maybe partly because of the name, but it was still really tasty! Practical info: Location: 231 W Front Street; Hours: Mon-Fri 11am – 1am, Sat-Sun 10am-2am. The winner for the best brewery in Missoula of all time goes to Imagine Nation Brewing with their bison-shaped winner. That alone made me warm towards the brewery and we found ourselves more impressed as we tasted the beers on tap. This is one of the newest Missoula breweries in town, but it’s definitely not a place lacking in quality brews. We had already heard one negative comment about Imagine Nation from the taxi driver who picked us up from the airport, who had mentioned the proximity to the homeless shelter and drunks that would obviously head over to the brand new brewery now. However, this driver had clearly never been to the brewery herself, and what we found was not at all like she thought it would be. What’s great about Imagine Nation is that it’s also a center for community transformation & education. 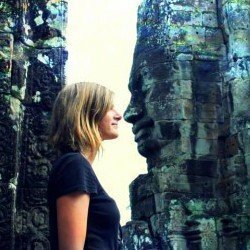 Their whole purpose is to bring the community together, create a dialogue and teach mindfulness in order to inspire social change for the better. How cool is that!? The staff were friendly – but who isn’t in Montana? – and the brewery came off as having a very local hangout feel. They also have free Sunday movie afternoons and popcorn and plenty of live music throughout the week. We saw Selma while we were there, nothing better than beer, popcorn and a movie to start off your Sunday afternoon! My favorite brew of theirs was the Oatmeal Stout on nitro, which I believe was called The Luminous Folly. So good. 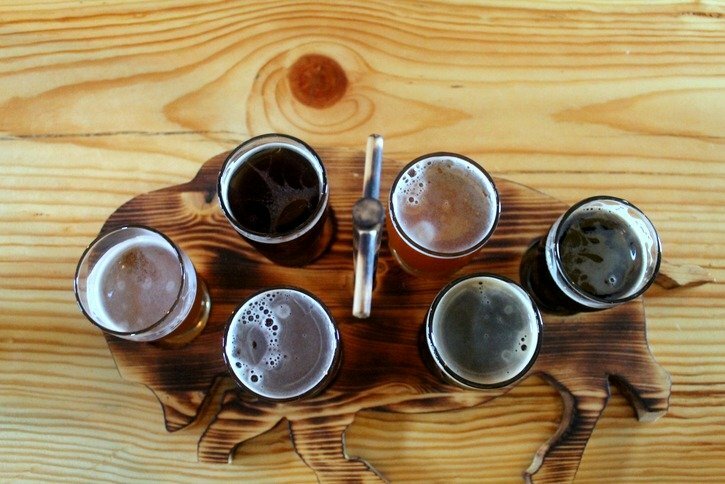 Why yes, this is a bison shaped tasting tray. Practical info: Location: 1151 W Broadway Street; Hours: Mon-Fri 2pm-8pm, Sat-Sun 12pm-8pm. Another one of our favorite Missoula, Montana breweries was Draught Works Brewery, which, similar to KettleHouse, is located on an unassuming street off the main drag of the city. The patio was covered in snow and uninhabited, but I could see it as a great place to hang out on the weekends or after work during the summer. The best part about Draught Works, besides their beer, of course, is their penchant for live music. When we came for a visit there was a free show going on, a soulful jazz trio, that created the perfect soundtrack to our beer tasting quest. Draught Works is on the larger side compared to some of the other Missoula breweries, but it still came off as having a very cozy feel once you walked inside. Missoula is already driven by community engagement and Draught Works was just another example of that. My favorite beer at the brewery was their refreshing Shadow Caster Amber Ale. Practical info: Location: 915 toole Avenue; Hours: open every day 12pm-9pm. Pints poured until 8 pm, growlers filled until 9 pm. 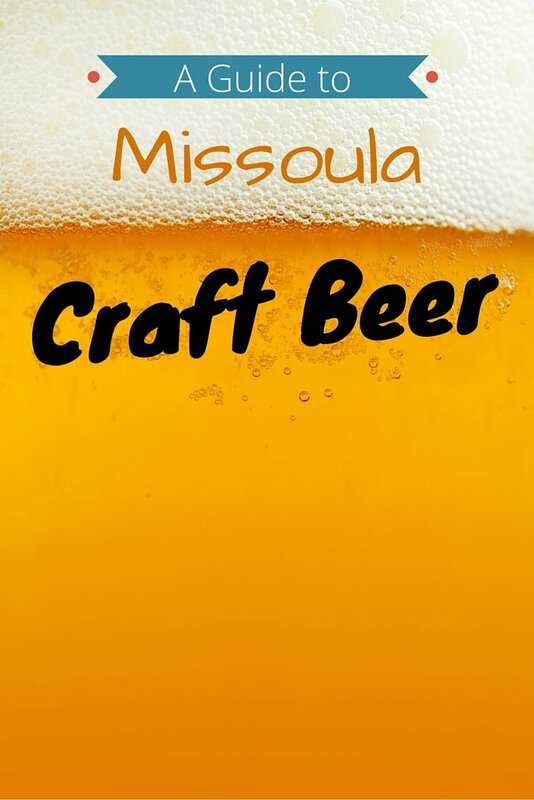 And onto the breweries that we didn’t make it to this time around, but still, deserve a mention as this is after all a guide to Missoula craft beer. 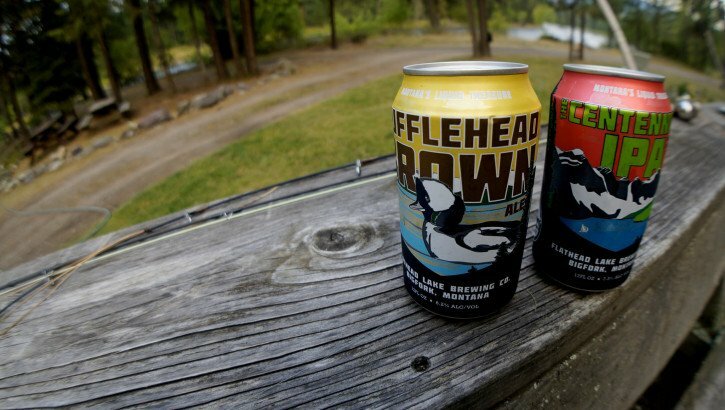 Flathead Lake Brewing is technically from Woods Bay, but they have a pub house in Missoula on N. Higgins. They have their own barrel house in Woods Bay so you can expect some quality sour beers from them, including their Montucky Sour Cherry Brown (great name) and Flanders Red. The brewery started in 2004 and they opened up the pub house in Missoula in 2010. It has been going strong ever since. 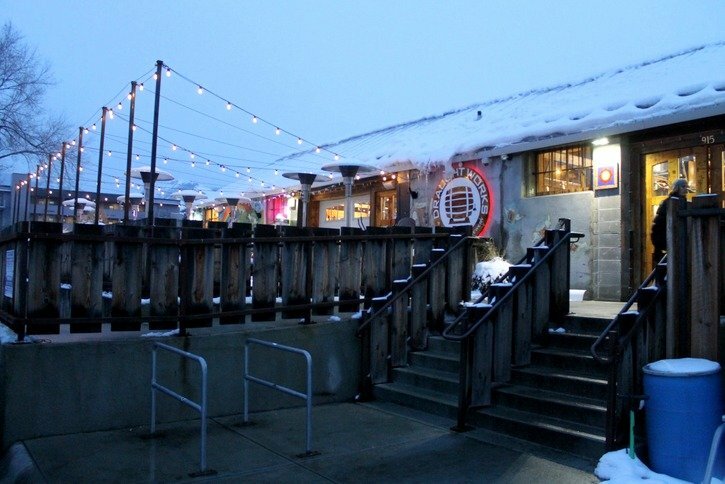 The location in Missoula is one of the best Missoula breweries with food and serves great craft beer and quality food. So if you’re hungry and thirsty this seems to be the place to go. Practical info: Location 424 N. Higgins Street; Hours: Sunday and Tues-Thurs 3pm-12am, Fri-Sat 3pm-2am. Closed Mondays. I really wanted to stop by Bayern since it was one of the only breweries I recognized while in Montana, but sadly time was not on our side for this trip to Missoula. 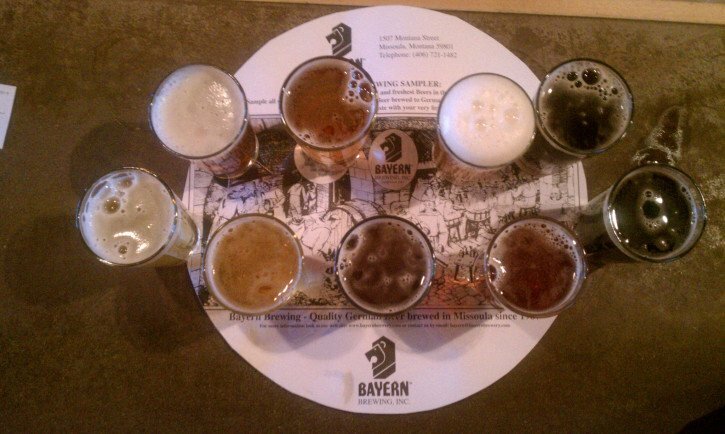 Bayern Brewery is one of the top Missoula microbreweries and one of the oldest and only German microbrewery in the Rockies. They specialize in Bavarian style beers and they’re 100% locally owned and operated. 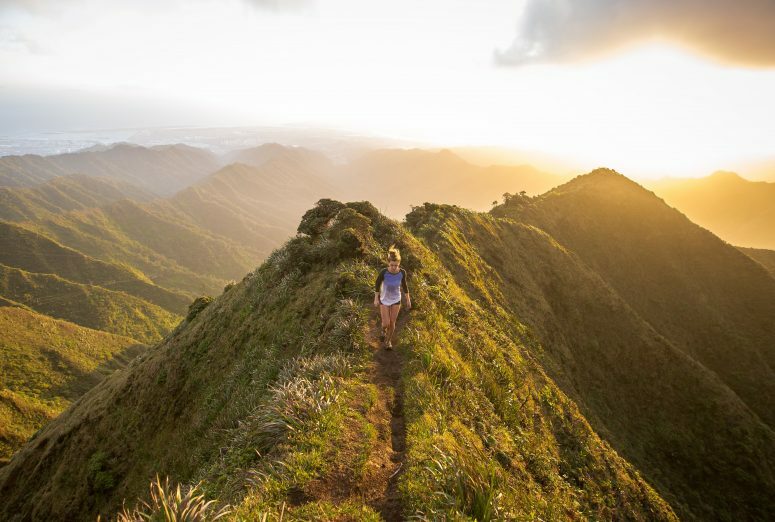 They’re also seen as the leader in the Northwest for sustainable business practices and environmental responsibility – something I always look for in local businesses! You’ll find everything from Schwarzbiers, Doppelbocks, and Weizens to all that’s in between. They even celebrate Oktoberfest properly by releasing a seasonal Oktoberfest beer every year for the festivities. Practical info: Location: 1507 Montana Street; Hours: open everyday 12pm-8pm. Big Sky Brewing was really the only other brewery I had heard about outside of Montana before I arrived, and that’s largely in part to their ever popular Moose Drool Brown Ale – found almost everywhere in America. 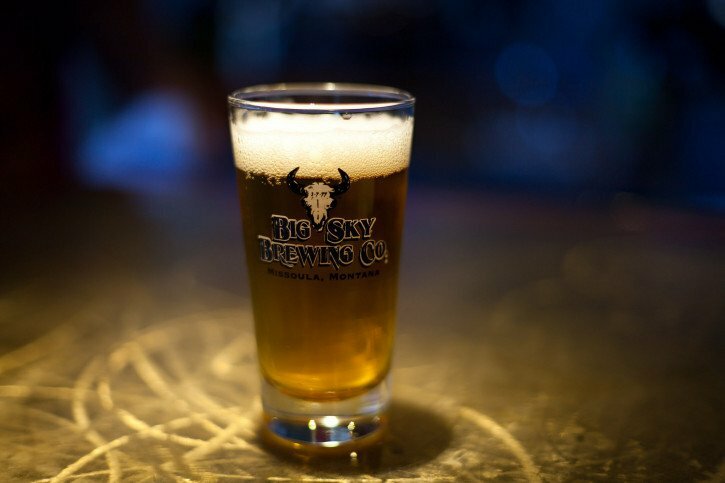 Big Sky came after Bayern and they were the 2nd brewery to set-up shop in Missoula in the mid-1990s. The brewery offers up fairly standard styles, you won’t generally find many crazy out-there brews, but that’s not to say they don’t produce quality beer. They also offer 4 free samples of their Missoula beer for every visit, who can say no to such hospitality? Practical info: Location 5417 Trumpeter Way; Hours: Mon-Fri 11am-6:30pm, Sat 11am-6pm. Closed Sundays. One of the relatively new and lesser-known Missoula breweries in town, located on the south side of Missoula, Great Burn Brewing features West Coast hop-forward beers that would be the dream of any IPA enthusiast. Great Burn started in 2013 and is known for quality local brews and very inexpensive ones at that, with some beers costing as low as $3. Although their selection of beers is still fairly limited compared to some of the other breweries in Missoula, Great Burn would still be a place to check out if you’re into your craft beer (and especially hops). Practical info: 2230 McDonald Avenue; Hours Sun-Thurs 2pm-9pm, Fri-Sat 12pm-9pm. If you are looking for luxurious accommodations to stay at while you enjoy sipping Missoula beer, then you need to check out the DoubleTree by Hilton Missoula Edgewater. Located on the banks of the Clark Fork River, this DoubleTree hotel is the perfect place to relax after a long day enjoy a variety of Missoula activities. Guest can enjoy Northwest specialty dishes and drinks at the hotel’s on-site restaurant, the Finn and Porter. This hotel offers comfortable and spacious rooms, stunning views of Mount Sentinel, and a modern gym and jacuzzi. C’mon Inn Missoula is the perfect hotel for anyone who is looking for a mid-ranged priced accommodation that is located fairly close to the majority of things to do around Missoula. This cozy, rustic hotel has an indoor waterfall, indoor pool, five hot tubs, and serves a full hot breakfast every morning. C’mon Inn also features a business center, fitness room, games room, and airport shuttles. The Campus Inn Missoula provides guests with a home away from home without breaking the bank. Every room at the Campus Inn Missoula comes with air-conditioning, coffee machine, and cable TV. Guest can also enjoy a daily continental breakfast, fitness center and shared lounge. If you need more information about things to do in Missoula, Montana, don’t be afraid to ask the friendly staff at the front desk. 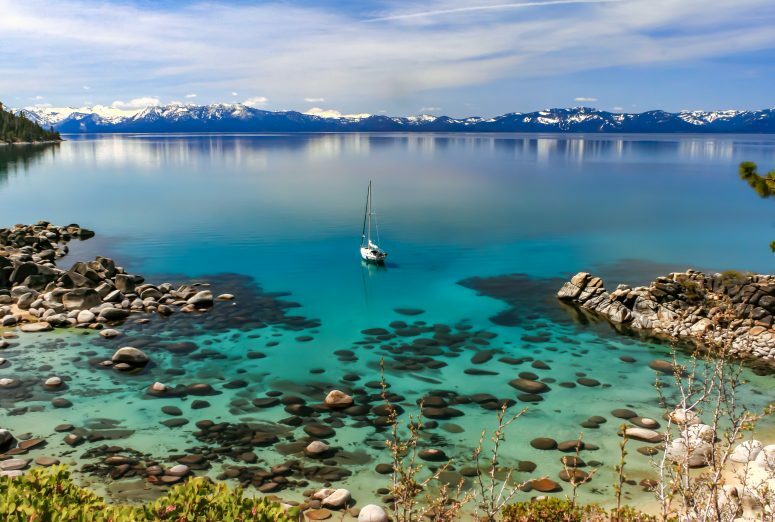 If you are looking for more things to do in Montana, check out these adventures filled tours. The West Yellowstone: Helicopter Tour will allow you to enjoy a bird’s eye of the stunning lakes and mountain peaks that make up the greater ecosystem of West Yellowstone. You can enjoy a 30 – 60-minute flight. Spend a half day biking through the Glacier National Park on a guided bike tour. 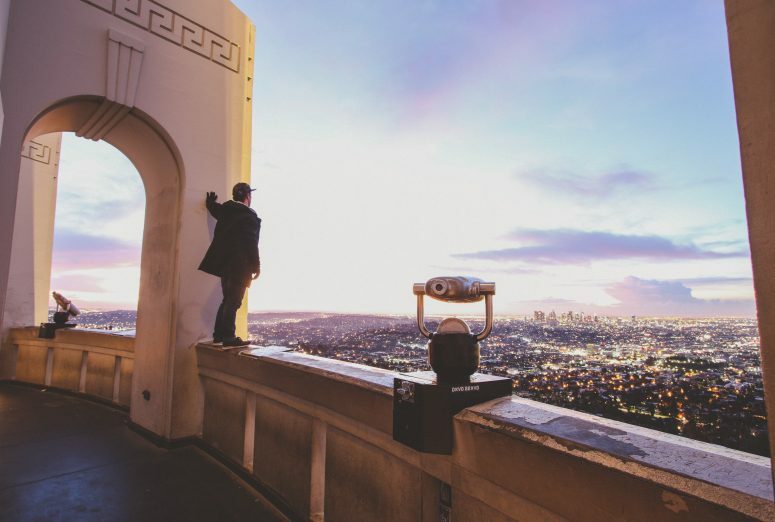 You will be able to admire stunning panoramic views and eat a delicious packed dinner. The Glacier National Park: Half-Day Whitewater Rafting Trip is the perfect adventure for all who are explore beautiful Montana. You will raft down the Middle Fork Flathead River with a guide, enjoy class 2 and 3 rapids. Have you tried any of these beers? 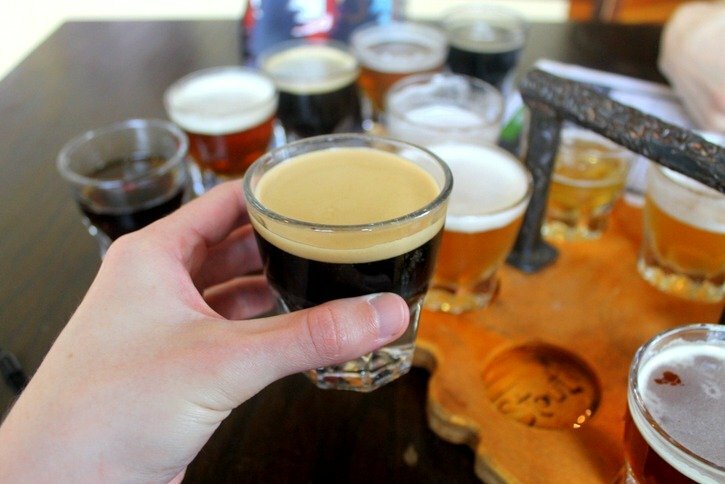 What city has your favorite craft beer scene? Buy your Montana Travel Guide here. Interested in getting more inspiration for your upcoming trip to Montana, check out these related posts below! 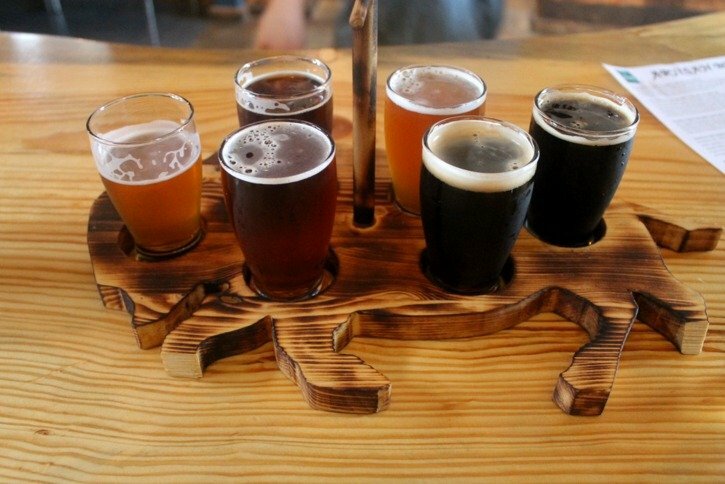 Yum…these beers look amazing! Now I’m totally in the mood for a cold one! I’ve been to Portland and was blown away by the food, and the beer or course. Guess I’ll have to look into Missoula! That’s great to hear Matt, I haven’t been so impressed with the Portland scene as I thought I would be, but there’s definitely still some gems in the city. I think I enjoyed Missoula’s craft breweries so much because of the culture of friendly openness in talking about beer with customers – something you don’t find so easily in Portland.